Staying confined in one place for long three months is a ritual! The instant question that may pop up in one’s mind is if such a ritual has any relevance to today’s fast-paced life. Bizarre it may be for many, yet the answer is yes. Vassavasa or “rains retreat” is one such ritual practiced mainly in the Theravada Buddhist tradition. Vassavasa is an annual three-month monastic retreat. During this period, the monastic remain in the monasteries or vihars respecting the rain and engaging themselves in the study of the scriptures and contemplation. Generally, they do not go outside the vihars except in the case of urgency. But when they do, they make sure their journey is a brief one. Though this ritual is mainly for the monastics, the lays also follow them, respect their cause, and support them by offering them alms during their indoor-stay. It is an important practice for the Buddhists of Assam as well, as they are the followers of Theravada tradition. The date and time of this retreat are determined by the lunar calendar and, generally, it begins on the full moon day of the month of July. In Assam, this year, it begins on July 27 and ends on October 24. Like every ceremony that starts with some specific customs, Vassavasa begins with a ceremonial observance. It is known as ‘upusat’ in the Buddhist communities of Assam. ‘Upusat’ marks the formal inauguration of this annual three-month retreat. When asked about it, Gyanawada Bhikkhu, the chief monk of Margherita Buddha Vihar, said, “Upusat is observed on the first day. It is a small ritual of taking a vow of remaining in the vihar during three-month rain retreat. 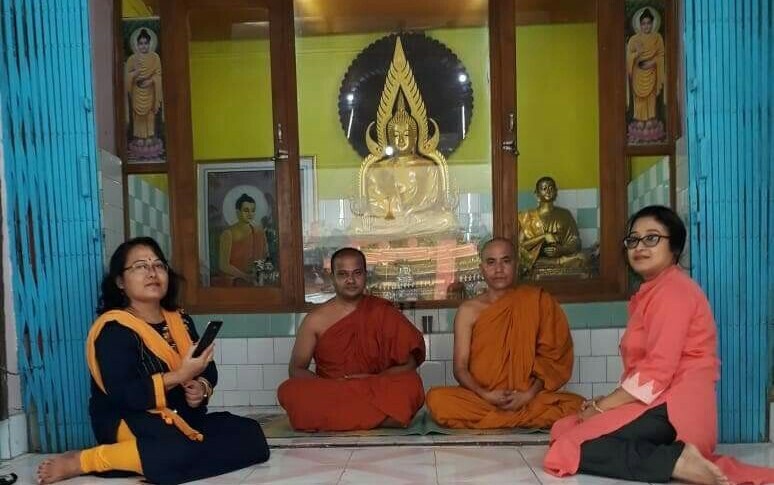 We do it in presence of at least five monks.” Ordained in 1985, Gyanawada Bhikkhu has been serving the people of Margherita through the teaching of the Dhamma since 2004. The origin of Vassavasa dates back to the Buddha’s time. During that time, the Buddha and his disciples travelled from forest to forest, village to village offering teachings and receiving alms. But during monsoon season, which generally starts in June or July in India, they could not travel due to incessant downpour. This led them to find a place to take shelter in until the bad weather is gone. Moreover, newly-planted crops that grow during this season damaged when they traveled occasionally. And the small animals like frogs, snails, leeches, worms etc. come out in the rain could be crushed underfoot. This thought of the Buddha that led to this practice is deeply revered by the monks of Assam till today. In Assam, many of the vihars or monasteries are situated at remote places that lack well communicable roads. Monks have to walk across the rice fields to get to their destinations. Devotees who go to the monastery of Mounglang in Tinsukia district of Assam to pay homage to Ven. Gunawantha Mahathera (99) can better say how it is not possible to get there without driving across the fields for some time in their total journey. Ven. 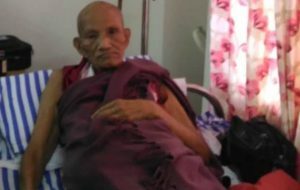 Gunawantha Mahathera is the oldest monk of Northeast India who came to India from Myanmar in 1952 and settled down at Mounglang in 1962. People of Mounglang owe much to him for his contribution to this then forlorn land and now a beautiful serene village, Mounglang. However, this ceremony is not solely meant for the monastics. For the lay also, it is a time to take leave from heavy works and to sojourn to contemplation and meditation. They make a variety of determinations like taking up a particular devotional or meditation practice or renouncing some old habits like smoking or drinking coffee or anything worse. Hence, it is a constructive time for the lay to engage themselves in wholesome thoughts and deeds. It is no wonder, then, that staying indoors for three months is right, for it is a brilliant way to make use of the difficult time outside in cultivating some virtues in the house.